Slow cookers are a great invention 🙂 As the evenings get darker and colder, our dinnertime cravings tend to be for warmer, heartier fare and we’re often ready to eat much earlier. Slow cooked dishes can give us just that. I LOVE Thai food so this is a great one for me. Chop an onion, peppers, potatoes and mushrooms in large chunks and add to the pot. You could also include seasonal veg like butternut squash. Pour in a can of coconut milk and then half fill the can with water and add that too, so that all the vegetables are covered. Add the juice of a whole lime and two generous spoonfuls of Thai green curry paste (OK so using ready-made paste is a little bit of a cheat, but even my Thai friend uses it!) and stir well. Throw in a handful of fresh basil leaves too. You could also add things like lemongrass if you want to be extra authentic. All you need to do now is leave it in the slow cooker all day on low and cook some rice just before serving. If you wanted you could make this a meat or fish dish by including chunks of chicken or some prawns. Chop half an onion, a whole leek, a third of a large butternut squash, some mushrooms and two peppers into large chunks and put in the slow cooker. Add chunks of casserole steak. Cover with about half to three quarters of a can of guinness and some water. Add a generous helping of rosemary and thyme leaves, a teaspoon of mustard and a beef stock cube or pot. Again, leave it to do its thing (8 hours on low or 4 on high) and serve with mash, jackets, or hunks of fresh bread. Chop half an onion, two peppers, some mushrooms and any other vegetables (I had squash to hand so added this). Put these in the slow cooker with sliced Beef skirt, and add a tin of plum tomatoes, chopping each tomato in half as you do so. Refill the can with water and add that too. Add heaped teaspoons of chilli powder, paprika, cinnamon, cumin and honey. 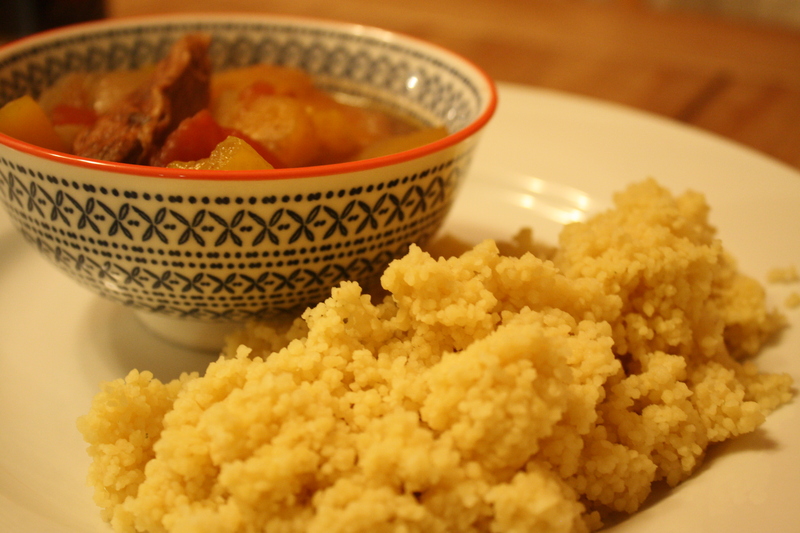 Leave in the slow cooker (again, 8 hours on low or 4 hours on high) and serve with cous cous. I make my cous cous with lemon juice and vegetable stock. This dish could be adapted by replacing the beef with lamb or adding apricots.